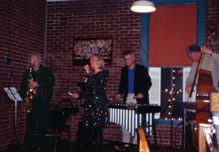 It's getting to be a habit: Here is Rebecca Kilgore performing "Moonshadow Dance" with Tall Jazz and Lee Wuthenow at the 2000 National Song Contest Awards, December 4, 2000, the second time Ellen Vanderslice placed first in the Blues/Jazz/R&B category. "Don't Look Before You Sing" is now available! For the fourth time, Ellen Vanderslice was awarded first place in the Portland Songwriters Association National Song Contest in the Blues/Jazz/R&B category. The prize was announced at the Songwriters' Showcase on December 2, 2003. Co-authors of the French lyric on this haunting "chanson triste" were Michael Ronkin of Salem, Oregon, and Edwige Gbadamassi of Avernes, France. The annual contest drew more than 30,000 entries from around the world. First Prizes were awarded in fifteen song categories. Ellen Vanderslice was honored by the Portland Songwriters Association at the 2001 National Song Contest Awards Ceremony, sweeping first, second and third places in the Blues/Jazz/R&B category for 2001. The awards event was held Monday, December 3, 2002, upstairs at the Buffalo Gap, 6835 SW Macadam in Portland. Jazz vocalist extraordinaire Amandah Jantzen flew in from Spokane for the occasion to perform the first place winning tune, "Sweet Elusive One," and third-place "All That's Missing Is You." Ellen sang "The Probability of Love," which, against all odds, was chosen for second place. They were backed by a fine jazz ensemble including Dan Gaynor, keyboard; Neil Masson, drums; and David Evans, saxophone. Mike Horsfall is co-composer of "The Probability of Love" and "All That's Missing is You." Ellen and Mike also collaborated on the First and Second Place winners in the Blues/Jazz/R&B Category of the 2000 PSA Awards, "Moonshadow Dance," and "Sweet Elusive One." Ellen's first winning tune was "If I Never See You Again," co-written with husband Scott Parker, which took first place in Blues/Jazz/R&B in the 1999 PSA Awards. All six winning songs appear on the 2001 CD, "The Standard Vanderslice." If you like Ellen's music, why not write a review for cdstreet.com?